Piping (mold inlet & outlet) (inch) 3/8" / 1/2" x 2 1-1/4" / 1-1/2" 2" / 2-1/2" 3/4" / 3/4" 1" / 1-1/2" 2" / 2-1/2"
Piping (cooling water in & out) 1/2" / 1/2" 3/4" / 3/4" 1-1/4" / 1-1/2" 1/2" / 1/2" 3/4" / 1" 1-1/4" / 1-1/2"
Please replace thermal oil every 2000 hours. 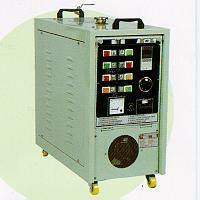 Water/oil dual purpose machine can use either water or oil heating medium. Special compact construction means both heating & cooling of the medium being used is done within the unit. Two step heating selector gives rapid temperature increase control when required thus saving time & power i.e. start up in mornings. The stainless steel tank (SUS304) guards against corrosion & is safe from rust & leaks. parts and components for plastic injection molding machines.